Do you live near the ocean? Maybe you will. New research on different factors relating to sea level rise, from increasing understanding the behavior of Antarctic ice sheets to revised global temperature predictions, are coming together to create an increasingly dystopian (and damp) picture for 2100. It’s increasingly plausible that by as early as 2060, let alone 2100, we may see a one meter increase in sea levels. One meter doesn’t sound that threatening, right? I mean, that’s way shorter than me. But check out these maps. 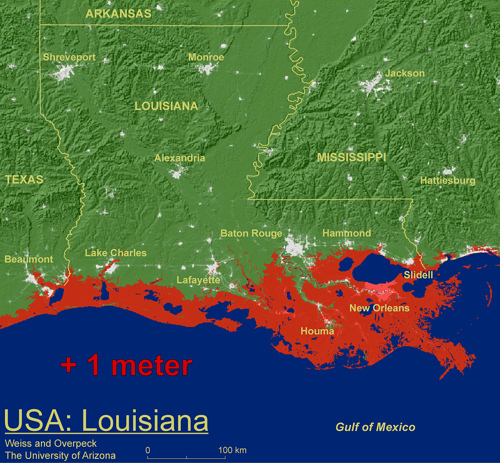 Here’s what a one meter rise in sea level would mean for one of my favorite parts of the US. It turns out that a one-meter rise in sea level is super upsetting! And take a look at poor Florida. Key West is gone! These sea level rise predictions aren't coming from people on the fringe. These are reasonable, even fairly conservative, estimates for 2100 (if not before). Sea level rise is likely to affect coastal cities all around the US, with particular concerns for places like the Bay Area, Charleston, and New York. I suggest using this handy and distressing website from Climate Central to check out when you and your loved ones may need life rafts. Sea level rise isn't just an American problem. Even moderate sea rise will severely impact many major coastal cities worldwide, from Calcutta to Dakar. Where will all these people go? More sobering news: while this increase in sea level rise is almost certainly going to happen, it could be a lot worse if we don’t take real action to cut carbon emissions. A crucial, if often underrated, prerequisite for such action is a public understanding of the science on which these predictions are based. This is a large part of the reason that NCSE's work to defend the teaching of climate science is so important. The reality of sea level rise is not a debate. It's something that is already happening. If we don't understand the non-controversial science behind this phenomenon, we might end up all wet.